Created sixty years ago by Rolex, the Oyster Perpetual Datejust Rolesor is the world’s most recognized and recognizable watch, if not the standard-bearer of an art de vivre. Impervious to the vagaries of fashion, it remains eternally modern.Subtly redesigned over time, the Oyster Perpetual Datejust Rolesor, archetype of timeless luxury, embraces all the latest watchmaking innovations to meet the most demanding technological requirements. The history of this must-have masterpiece of contemporary watchmaking is rooted in the rich heritage of Rolex timepieces. It is the fruit of the Oyster, the first waterproof and dustproof wristwatch entirely designed and manufactured by Rolex in 1926. The movement of the watch receives its energy from the Perpetual rotor, the first self-winding mechanism with a free rotor, created in 1931. The Datejust made its debut in 1945, its name inspired by the date displayed in a window on the watch dial. The Oyster Perpetual Datejust Rolesor is the hallmark of the Rolex brand. Precise, waterproof, self-winding, this officially-certified Swiss chronometer with date display is crafted with only the noblest of materials and assembled with the greatest of care. The Datejust II Rolesor makes an exquisite addition to the extensive range of the Oyster Perpetual Datejust family. The case, in yellow or white Rolesor, available for the first time in 41 mm, marries optimal comfort with elegant refinement. Fitted with a fluted bezel, the watch is waterproof to a depth of 100 metres (330 feet). 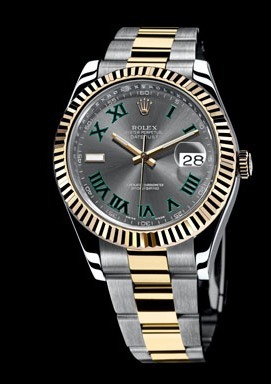 The Datejust II is equipped with a calibre entirely designed and manufactured by Rolex. It features a Parachrom hairspring, highly resistant to shocks and magnetic fields, as well as new Paraflex shock absorbers, which ensure its superlative chronometric precision and remarkable reliability. The movement is chronometer-certified by the Swiss Official Chronometer Testing Institute (COSC) and has a power reserve of 48 hours. The Datejust II features original dials that are, at once, contemporary and altogether classic. The Datejust II is available on an Oyster bracelet, fitted with an Oysterclasp and Easylink extension link, providing additional wearer comfort.